I had three lots of nice feedback lately, a nice reward after striving long and hard to get the novels into shape. First, my publisher tells me the reaction to Hal 1 has been very good. The distributors and book reps are behind it, and one chain store is apparently going to make the novel a group purchase and will feature it in their September catalogue. That's the sort of lift for a novel which money can't buy. Second, my editor sent me a quick email to let me know how much she's enjoying the revised edition of Hal Spacejock 2. 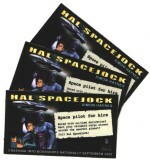 Third, I got an email from someone who bought a copy of Hal Spacejock off me a couple of years ago. (That would be the first edition, hope he's still got it ;-) He told me that my novel inspired a love of reading in his eldest son, to which I say... Magic! As an author, nothing could please me more. When I hear about Harry Potter breaking records and Harry Potter making millions for JK Rowling (good on her! ), all I think about is hundreds of thousands of kids with their noses in the latest book, lost in another world as their imagination works overtime. After seven books, you can bet they'll be casting around for more. Here's a tip - if your budget doesn't stretch to new kids novels at $20 a pop, just drop by a Salvation Army or Red Cross charity shop, where you can pick up armfuls for 50c to $1 each. Don't worry about whether they're any good or not - your kids will develop taste all by themselves. Simon's Law: Every child should own 300 - 400 novels. My publisher organised a batch of fridge magnets to celebrate the upcoming launch of my novel. If you want one, see my fridge magnet giveaway page. There's nothing quite like it. After four months of rewriting, rewording and replotting Hal Spacejock 2, I finally emailed it to my editor. And I beat the deadline by one day, which is icing on the cake. I finished the original novel in 2003, and you might wonder why it needed 4 months of work when I already considered it done way back then. First, a book is never finished. You can always cut more flab, and you can always improve the plot or characters. Second, writers get better with practice. After you've written three or four novels, your earlier stuff can start to look pretty dire. During a rewrite you can address both of these problems. Yesterday I read straight through the first ten chapters with a big smile on my face, enjoying myself immensely. I suppose the parallel is when a director first sees the final cut of their film - for ninety minutes (or three hours, if you're Peter Jackson...) you close your eyes to the camera angles, editing and hastily-completed sets and just enjoy the thing, soaking it up like a regular cinema patron. Then, on to book three!